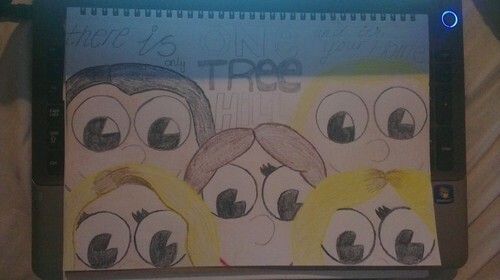 One Tree Hill - Cartoon Style. Decided to do a drawing cause I'm ill. I know it's quite crappy but oh well. In case you can't tell, bottom left is Haley, bottom right Peyton, above Peyton is Lucas, above Hales is Nathan & in the middle is Brooke. HD Wallpaper and background images in the Leyton Family<3 club tagged: albiee bee one tree hill brooke peyton haley nathan lucas cartoon.